Oh boy, has life gotten in the way lately ;) It's been quite a few busy days with relatives in town, a wedding, and work. I should just start calling this 'saturday catch up' rather than friday five, since I've been a day late this past month. Yikes. Anyway, it is what it is. 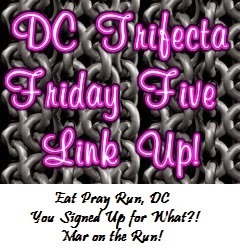 I'm linking up with the DC Trifecta: Courtney at Eat Pray Run DC, Cynthia at You Signed up for What?, and Mar at Mar on the Run, as I do every week. Thanks for hosting, ladies! 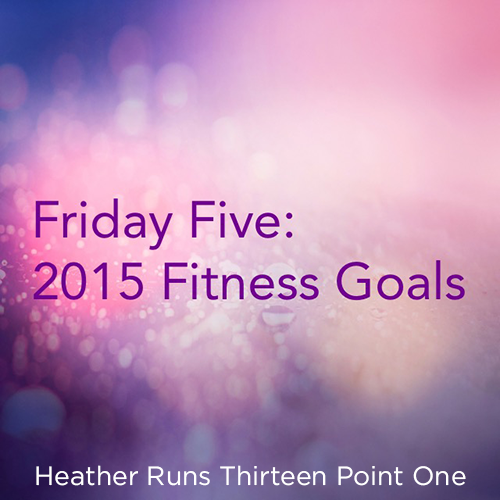 This week's theme is "Fitness Goals". 1. Complete my first marathon. I'm not too far away from checking this off my list. I'm excited and nervous! 2. Register for marathon #2. Yes, even though I have yet to finish the first one, I'm already thinking about registering for another this year (hoping to get picked in the Chicago Marathon lottery). 3. Beat my half marathon time. Seeing as it's just over 3 hours, and I have been getting faster as 2014 came to a close, I know this is an attainable goal (and maybe I'll even be able to set a PR early in the year, and then beat that later in the year – that's what I'm really reaching for). 4. PR in the 5k and 10k distances. Again, my times are pretty slow for those, so I know it's a goal that's within reach if I keep up with my training. 5. CROSS TRAIN. This is a big one – one of the main reasons I joined a gym. I want to start swimming, along with taking some other random classes there to see what I like. Cross training at least twice a week with three days of running is my starting goal, and then seeing how I'm feeling from there. How about you – what are your goals or resolutions for 2015? I'm excited to hear about your first marathon experience. This is one of my goals as well. I'd also like a half PR but definitely need to crosstrain. I am not good about that at all. Here's to an epic 2015! Thanks! It came so quickly - hope to see you there! Great goals. Best of luck with them. I could use some cross training to mix things up a bunch. Thanks John! I know how important cross training is, yet I rarely manage to schedule it in... this year will be different! Nice goals and good luck at Dopey Challenge this week. So excited for everyone going to WDW for marathon weekend and sad that we won;t be going this year.